As Educators, we need to recapture the wonder of Winter. This has sadly been lost on many adults and unfortunately seen as an ordeal to be endured! As Early Years Educators it is essential we see the magic which surrounds us and shares the opportunities with our curious little learners. To regain our inner child and see the wonder that is all around us when we dare to venture outdoors. To see the benefits of getting outside during colder winter days. As adults, many may fear that it’s too cold for children to play in the snow, rain or colder temperatures and can often many parents can be heard saying “their child isn’t well enough to be outdoors.” Regardless of the season outdoor play is essential for the health and well being of our youngest children. We must bring the magic of outdoor play, back to childhoods and what better way to experience nature than investigating snow for the very first time! It is our job as Early Years professionals to help educate parents and carers about the benefits of outdoor play, especially when the temperature starts to drop to single figures. In Britain, Winters are quite mild compared to that of other countries around the world, Canada, Scandinavia, Finland and The United States of America, to name but a few. These countries can see temperatures drop to – 20, -30 or even lower when the windchill is also taken into consideration. How do these countries cope with outdoor play in such extreme temperatures? Therefore in our British settings, there is no excuse for keeping children confined indoors and we should embrace the balmy climate Britain has to offer? How can we do this? At the Curiosity Approach, a huge part of our pedagogy is that of the mindful adult. Being present in the moment and seeing the positive things, life has to offer. There is also a practical side to getting outside that regardless of how happy and positive we are. We must ensure the fundamental practicalities and basics are looked after too. Its essential children and adults are prepared for going outside. To wrap up warm and be protected from the cold temperatures. Educators need to come to work ready for the day ahead. With changes in clothes and waterproofs. Snow boots or wellington boots will do the job fine. How can we adults hope to promote magic awe and wonder if we are miserable because our feet are freezing and we have the onset of chilblains? Educators are role models to the young children in our care and need to remain positive and enthusiastic about getting outside. If we are not fully prepared and dressed appropriately for the day ahead, how can we expect to take the little ones outside and enjoy the wonder of winter? It is important we dress children in at least three layers before they go out in the snow: a base layer, which wicks moisture away; a middle layer, which insulates warmth; and an outer layer, which offers warmth as well as moisture and wind protection. When asking parents to send children in suitable clothing, recommend wool and synthetics, especially base layers and socks. Favour synthetic fabrics and natural wool over garments made with cotton. Know that there is a difference between “waterproof” and “water-resistant,” with the latter being less effective at keeping moisture out of the garment. Check the label and ratings on coats and pants before you buy them. Another reason that many parents, carers and educators use to remain indoors is the myth or misconception that cold weather is associated with children catching coughs or colds. It’s important that we remember, children are more likely to become ill from being cooped up in centrally heated rooms, within the close proximity of others. Poorly ventilated rooms allow for bacteria and viruses to spread quickly from child to child and therefore it’s essential we rethink about getting our children outdoors for prolonged periods of play. Being outdoors, getting fresh air and experiencing nature is fundamentally important to the mental and physical health of humans. Mi-Hwa Park & Jeanetta Play in natural outdoor environments: A healthy choice wrote that serotonin is a brain neurotransmitter, a type of chemical that helps children stay calm and peaceful. Serotonin plays a critical role in controlling depression, violence, and suicidal impulses and in promoting children’s focused attention and memory. Serotonin strengthens T-lymphocytes which kills cancer cells and produces endorphins which play a role in producing a feeling of well-being. Therefore, children who spend more time indoors hidden from sunlight are likely to lack serotonin thus becoming more susceptible to depression and impulsiveness. The wonder of winter also provides children and adults with different ways of moving our bodies, this may include rolling humongous snowballs to create snowmen, sledging or walking through deep snow drifts. The snow creates a physical challenge, exhaustion and increases physical activity, raising heart rates and emotional well being. 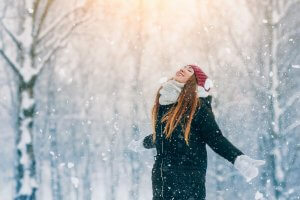 As many adults are under the misconception that there is very little to do outside when the whole of the outdoors is covered in a blanket of snow. It is important to remember that as adults we have experienced numerous winters. We have seen snow numerous times before. We know what snow feels like and how it feels on our face and fingers! We may sadly have had negative experiences of being ill-prepared for outdoor play and now this memory has been cemented in our subconscious mind and affects how we view the wonder of winter today. As mindful adults, we need to view snow and these winter months, through fresh eyes, embrace the season with the excitement of a young child. View the wonder of winter through a fresh lens, enabling us adults to view the outdoors differently and be positive and excited about the prospect of getting outdoors. See our further blogs and inspiration for activity ideas for outdoor play in winter. The wonder of winter! Look at your environment with fresh eyes!